Yesterday the sun shone a little - it didn't really give out much in the way of warmth but it was just enough to trigger one or two reluctant flowers to open and show their faces. The flower at the back looks as though it has had a a bit of a tough time but despite that I was happy to see it. 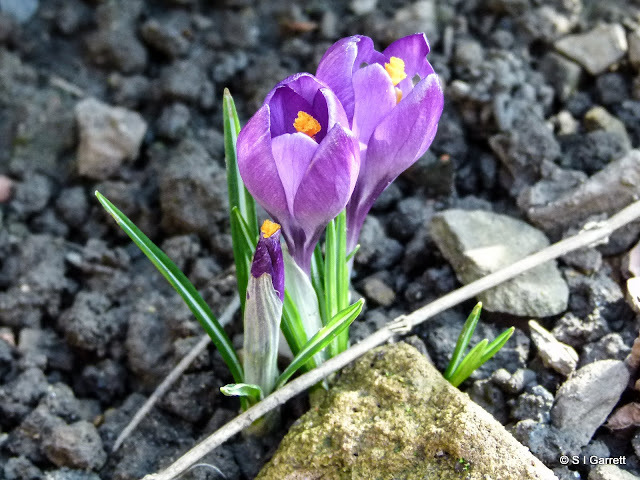 It wasn't just the crocuses (crocii?) that were happy to see the sunshine. 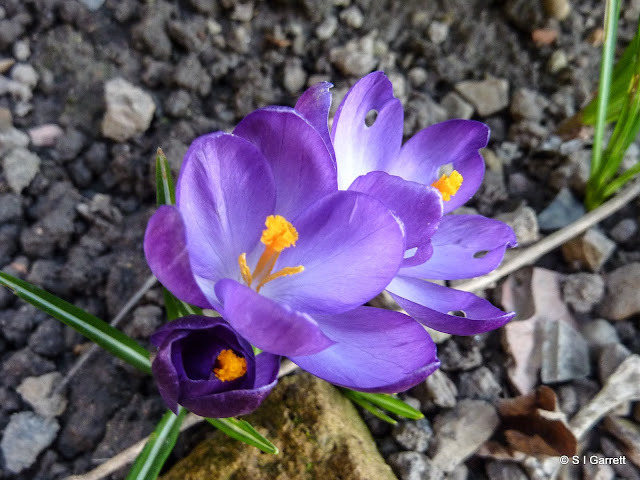 Martyn has posted a photo of another welcome bloom on his blog post here. We don't tend to sow many seeds until at least March but some things just can't wait until then and so we took advantage of some good weather to make a steady start. If you are a follower of Martyn's blog you will have already been tipped off about our progress but at the risk of telling you what you already know I'm going to put my take on things. The first thing to be given permission to start it's growing journey were the seed potatoes which had been impatiently waiting in the garage. These have been set out to chit but as a bit of protection against frost they have been given a fleece duvet. 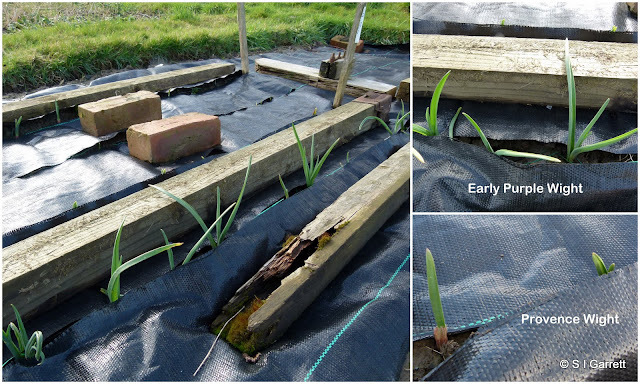 The conditions on the plot are just not yet ready to provide accommodation for onion and shallot sets and the ones we had bought were already showing signs that they were ready to start growing so we have repeated last year's technique of starting some in modules to be transplanted later. The shallot sets were an impressive size and so needed to be planted in larger modules than their onion cousins. I haven't planted all the sets - some more may be planted later and some will be planted close together straight onto the plot. Last year this method produced some very useful small onions. We're giving heat treated onions a miss this year. Last year they didn't warrant the higher cost of sets. As the heat treatment delays the delivery date of the sets, last year's were planted a little too late. We acquired some free onion seed in a magazine and so we are also going to have a go at raising onions from seed. 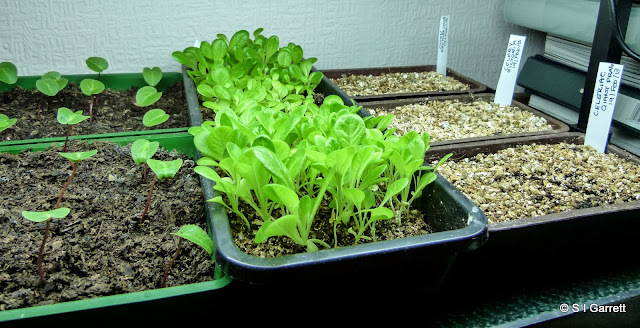 As this will need a long growing season, some seed has been sown and placed under the growing light in a spare room. Also planted are some celeriac and celery seed in yet another attempt to grow these elusive crops. These are also now housed under the growing light alongside the salad and cyclamen seedlings. I wonder if we will finally manage to achieve a celery or celeriac crop this year? If you are interested the tabs at the top of the blog point to various pages on my website. Amongst other things here we keep a full diary of our monthly gardening escapades and also log a full list of the seeds sown and crops harvested each month. I think I have mentioned before that I upload some of my photos to an online site called mydoodle where my images are offered by them for people to use in order to create their own wall art or greetings card designs. I'd never thought of doing this until mydoodle - formally known as Createtoday emailed me and asked me to consider this project. I receive a small amount of commission if any designs are used and so I decided why not? As usual when I start something new the idea grows and this resulted in me setting up a blog and website both called Designs on Nature. 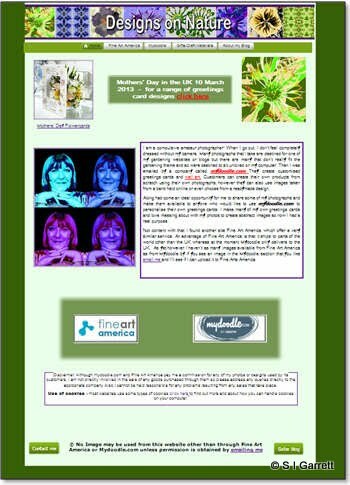 Then earlier this month I visited one of the blogs that I follow Graphically UK where Helene mentioned that she had started doing the same thing but used a company called Fine Art America. I visited the site and was interested as this site doesn't just operate in the UK but has a more international audience. Wouldn't it be exciting if one of my images turned up on a wall in the USA or Japan etc.? I was concerned that Helene would think I was just nudging in on her act and so I emailed her and asked if she would mind me signing up to also use FAA and as a result of our email 'conversation' I decided to upload a small number of images and see what happened. Helene has an extensive portfolio which is worth a look - mine is nothing like as wide ranging. If you fancy having a peep or maybe even having a go at uploading photos yourself you could have a peep at my mydoodle portfolio here of my FAA portfolio here. The tentative gardening link is that you will probably recognise some of the images as ones I've used on this blog. Although we managed to gather a good harvest at the weekend, not everything on the plot is looking rosy. We took the netting off our over wintering brassicas as in previous years the netting has collapsed under the weight of snow and flattened the plants growing underneath. I posted about the problem here. In previous years once the brassicas have achieved a reasonable size the pigeons have left them alone - not this year. 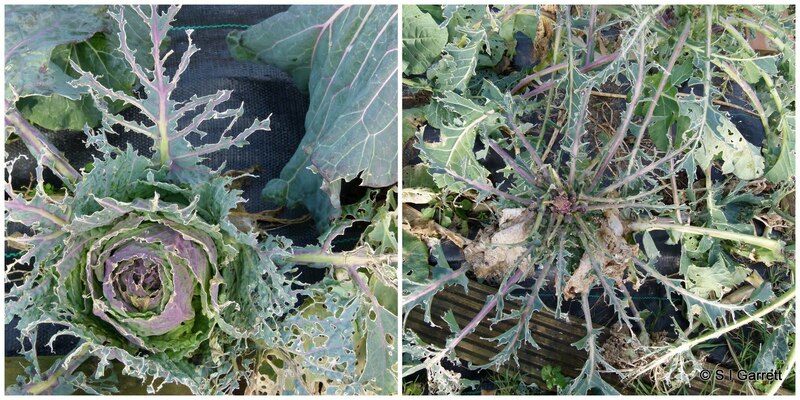 Everyone on our site is lamenting the loss of their brassicas as the pigeons have over indulged and devastated the plants. 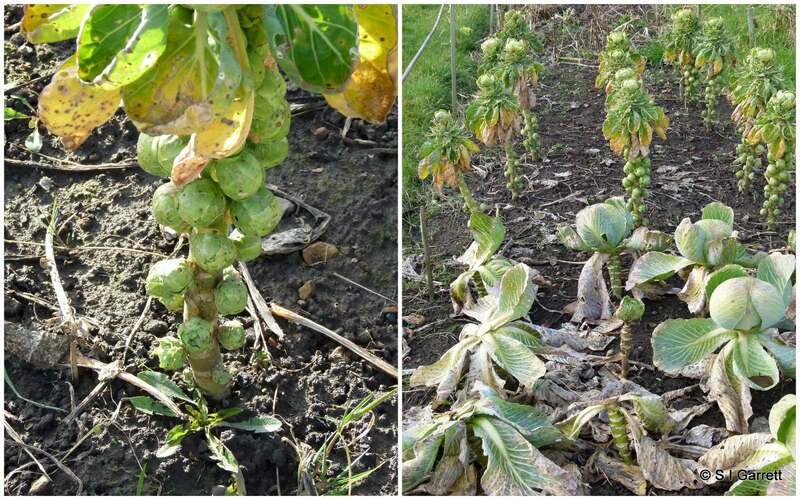 Although they have shredded the sprout tops they have left the sprouts and have also spared the 'autumn' cabbages. One of the disadvantages of an allotment rather than a back garden vegetable patch is that we can't be on hand to quickly respond to problems or changes in conditions. 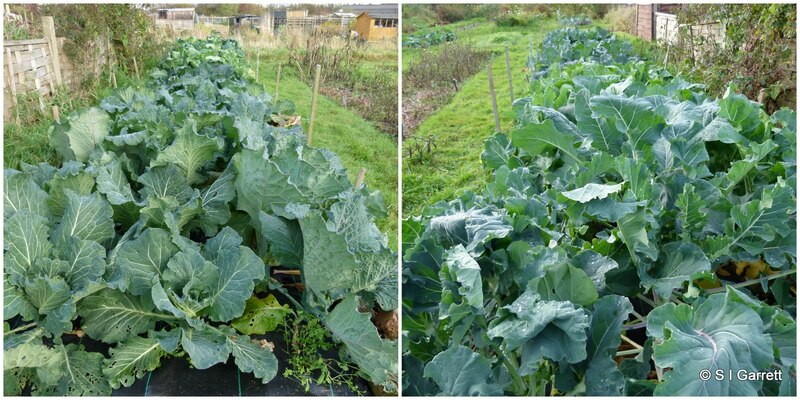 Our crops have to be able to survive without our constant attention so next year we will have to weigh up the chances of our brassicas surviving snowfall or pigeon fest. I'm not sure why the pigeons have been so destructive this year or whether this is now a new pigeon trend but at the moment snow damage seems the less of a problem. In yesterday's post I mentioned that a soup making session was imminent so I thought I would follow this up with confirmation that I did use some of our weekend's harvest to make a batch of soup. 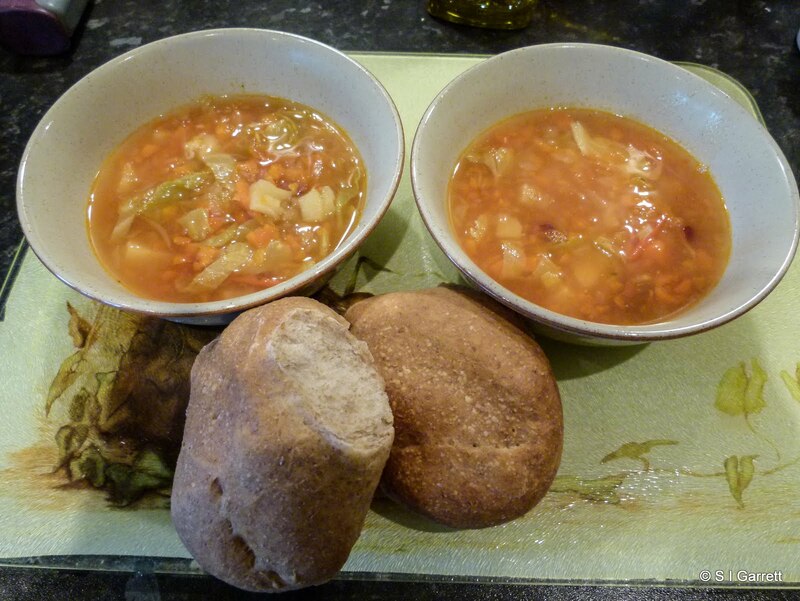 I made a sort of minestrone but without the 'mine' or perhaps the 'strone' i.e. no spaghetti. We had some frozen fresh spaghetti but no dried and I didn't fancy breaking up the fresh. OK I guess that you could say it was just a vegetable soup. Here is a very quick photo as Martyn was twiddling his spoon ready for his lunch. As you can see this was accompanied by Martyn's homemade wholemeal rolls so lunch was a joint effort. My soup was based on a recipe from this website but in the end mine didn't look anything like theirs. I left out the celery as we didn't have any - I could have put some leeks in as a substitute but didn't. I also used some of our own frozen tomatoes rather than tinned and I used a can of mixed beans in a tomato sauce - donated by my sister as we didn't have any. The tomato sauce made up for the lack of any from the tomatoes due to not using canned tomatoes. I also added a dash of tomato ketchup as what I thought was tomato puree in the fridge wasn't! I used what was left - after using some for dinner on Sunday - of a January King cabbage rather than savoy as that was the type of cabbage we harvested at the weekend. I maybe used less than asked for in the recipe as our cabbage was only a small one. I also didn't use as much stock as I reasoned that the dry spaghetti would have taken up some of the liquid so I used 1.5 litres rather than 2 litres. It was a good move. So to sum up all we had to add to our weekend harvest was a drop of olive oil, a can of beans, a slurp of ketchup and some vegetable stock. The recipe claims to serve 4 but there looks to be at least enough for another four helpings - maybe more. We managed a plot visit on Saturday with the intention of replenishing our fresh vegetable stock. For various reasons it's been a while since our last plot visit so we weren't sure that we would have any vegetables in a fit state to harvest, however we were pleasantly surprised and came away with a sizeable haul. The beetroot were the biggest surprise as we had expected the roots to have been frosted. The layer of straw with which they were covered seems to have done its job. A soup making session is planned for this week! Visit Daphne's Dandelions for more Harvest Monday posts. 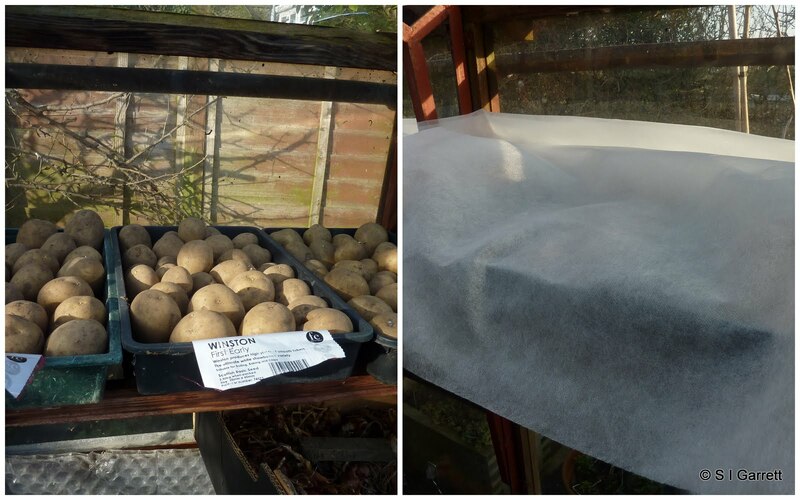 PS: The seed potatoes have now been set out in the greenhouse to start chitting. 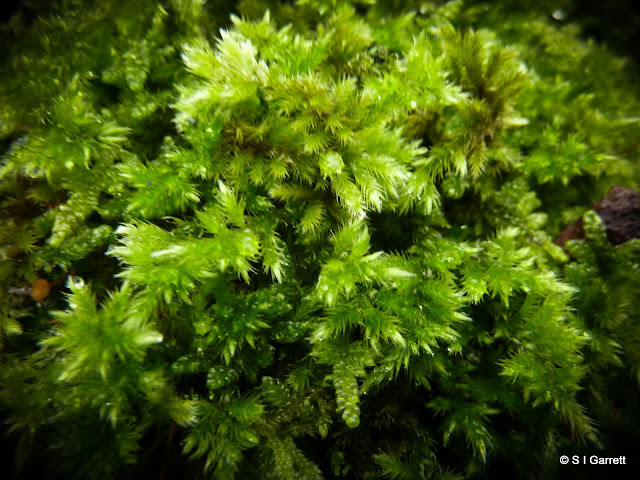 Martyn has written about this on his blog here and also listed the varieties that we are trying. So far that is as far as we have come to any seed sowing or planting! 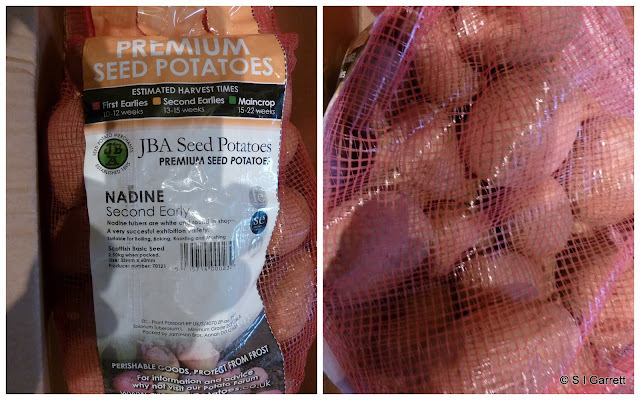 This year I decided to grow garlic using two methods instead of the three that I employed last year. 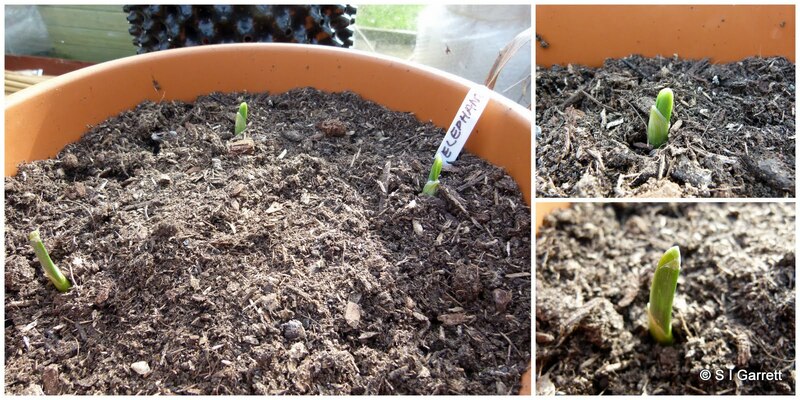 The garlic started in pots just didn't appreciate being transplanted. I've been thinking of why this method wasn't successful and I've come up with two possible reasons. 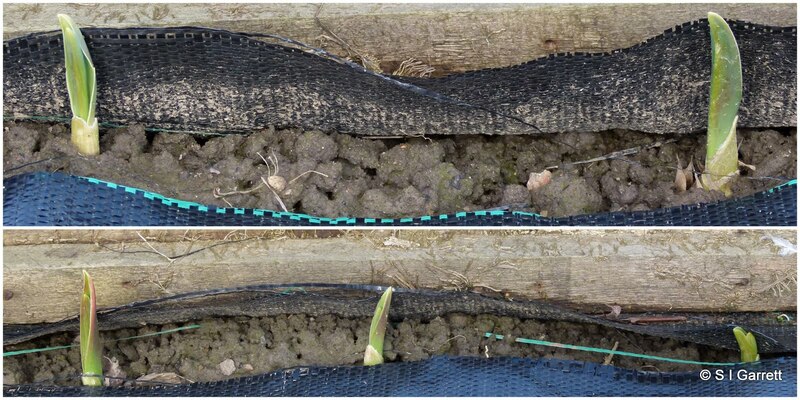 Either the plants became root bound before planting out (they did have lots of root) or the change in conditions when planting out was just too much for them to cope with. Whatever the reason I decided not to use the transplanting method this year. (Any other suggestions let me know). So how does my garlic grow? In the greenhouse the Early Purple Wight (hardneck) was off to a good start with the first shoots appearing in late November. It is still growing well. Finally that garlic pretender Elephant garlic. This again as expected has been the slowest of them all and is really just beginning to send up shoots. Surprisingly on the plot the elephant garlic is further on than that in the greenhouse. The opposite is true of the 'normal' garlic. The Early Purple Wight is growing well but behind that in the greenhouse and the Provence Wight is just getting going. 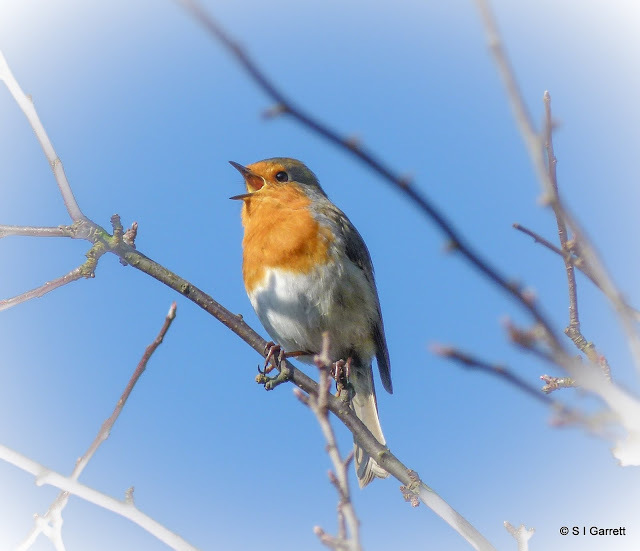 At this time of year when the temperatures are low, garden birds need a fat boost. Luckily for them they don't suffer from high cholesterol but the type of fat is important. I mix lard with various bird food to make a sort of cake. You can melt the lard and mix seed etc. into the melted mixture as I have described here on my website. But recently I have started to cream the lard and mix various types of bird feed into it. The last lot that I made contained feeder seed, buggy nibbles, Golden Chorus (even the hedgehogs love this) and sunflower hearts. You can also add such things as grated cheese, peanuts (whole or chopped), cake or biscuit crumbs, cooked or uncooked rice, dry porridge oats, mashed potato, raisins or pieces of fruit. 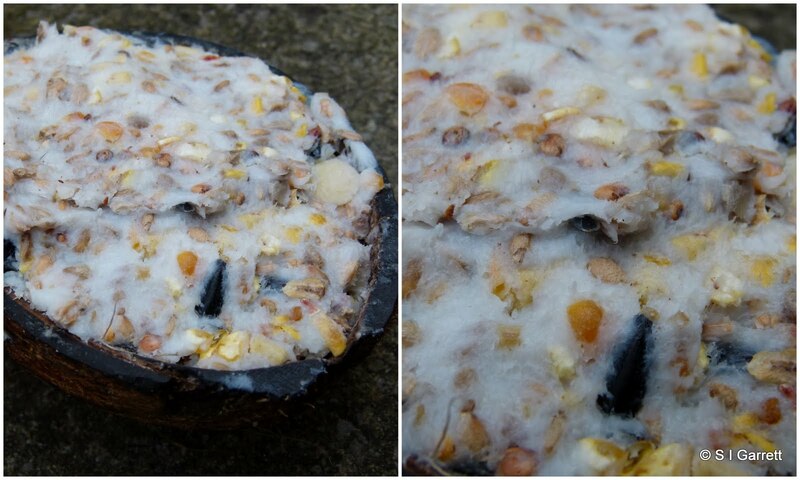 Once I had mixed the bird food into the lard I used most of it to fill up two half coconut - pressing the mixture down well so the shells were tightly packed. I only used one 250g pack of lard for all this. 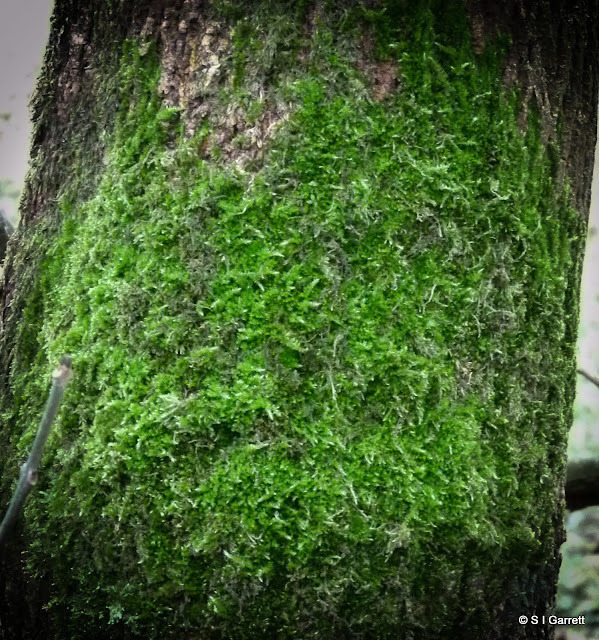 On our last visit to Fairburn Ings, a nearby RSPB reserve we noticed that they had been cutting back some of their silver birch trees and in the visitors' centre they had sections of tree trunk into which they had drilled holes. For a 20 pence donation, customers could take a log and fill it with some fat mix that they supplied. 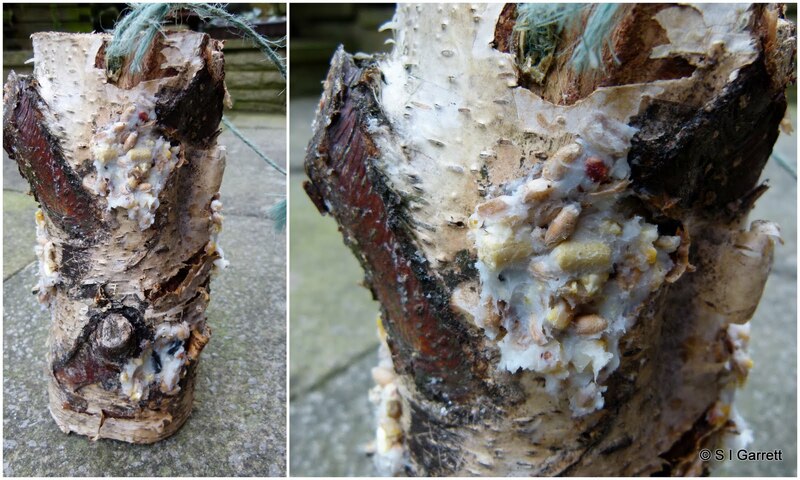 We did this and I have since refilled the log using my own fat mix. 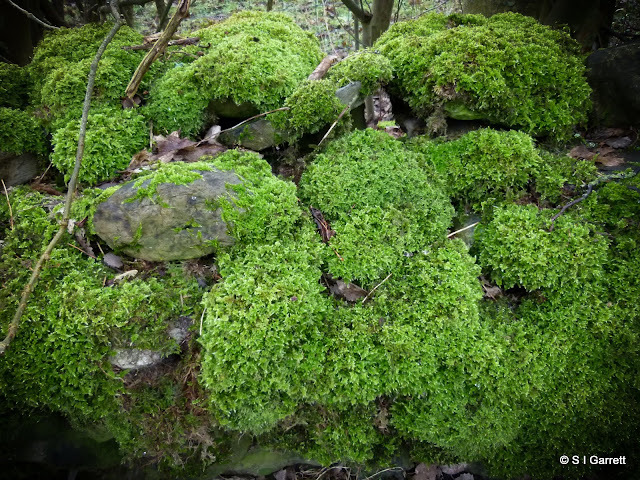 I thought this set up may encourage the great spotted woodpecker to visit more frequently. Although this hasn't happened, other birds enjoy it as the fat disappears. I have seen a female chaffinch trying its best to hover whilst pecking at the fat. Not something you expect it to do especially when there is a ready supply of other tasty morsels much more readily available. So why is the type of fat important? Firstly the fat needs to be a type that will become solid when cold as fats that remain fairly soft can smear the birds feathers. Soft fat cakes onto the birds beak and then is transferred to its feathers during preening. This means that the feathers can no longer provide effective insulation and waterproofing. That's very bad news for the bird. Recycling is usually a good thing but not so if you recycle fat left after cooking meat. This isn't pure fat and will contain fragments of meat which may in turn go bad and harbour salmonella. Any salt used in cooking would also be very bad for the birds. 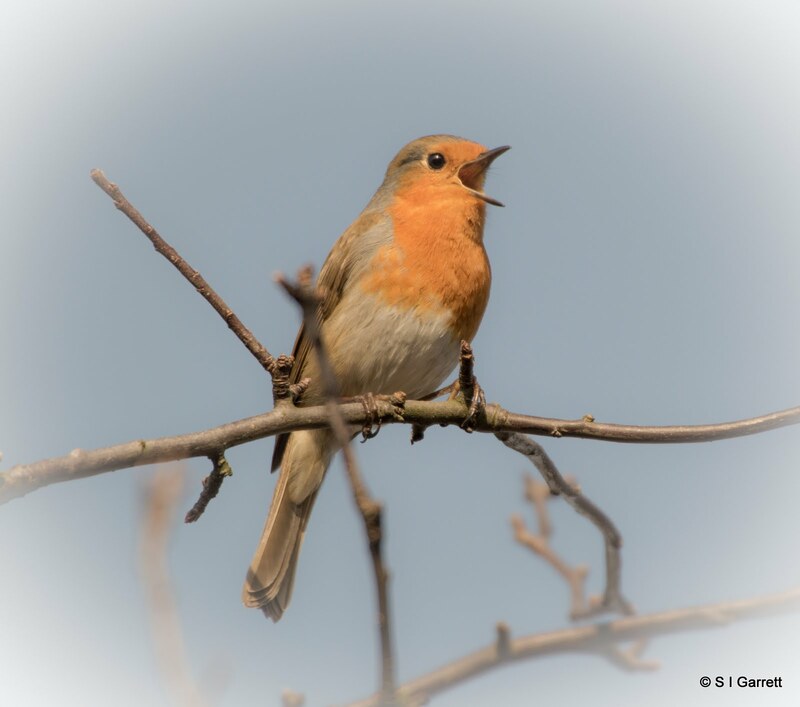 Not only does feeding the birds help our feathered friends but they help us by providing some garden interest when we may not be able to get out to do much gardening and from our windows there is a limited colour palette. During the freezing cold conditions of winter 2010-11 we lost a couple of rosemary plants. For this reason we bought a creeping rosemary as it is supposed to be hardier than the upright variety. 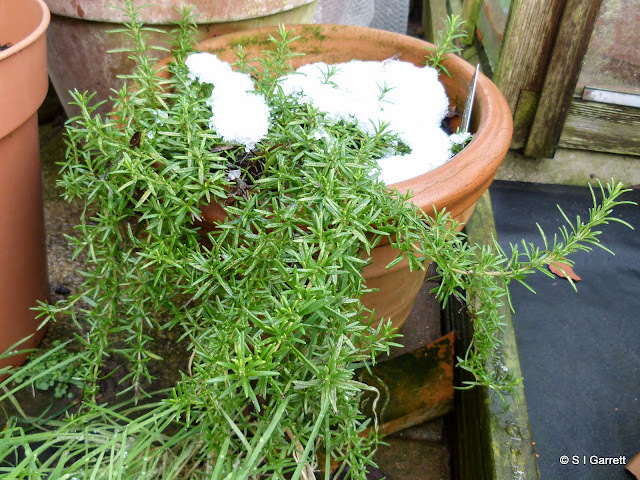 As well as having a couple of upright rosemary bushes on the plot we have one growing in a pot in the garden. We like to have some herbs readily available to pick fresh when cooking. 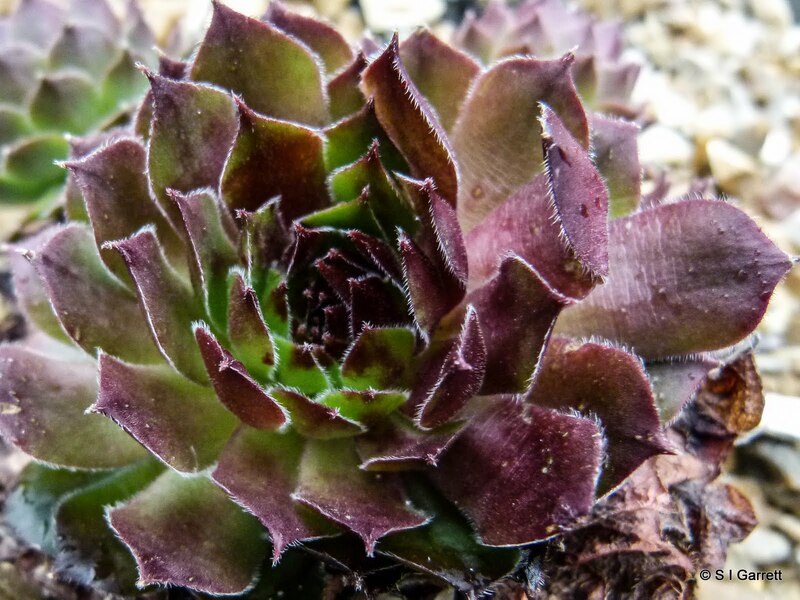 This year, before the snow descended on us, the plants were looking good and producing flower buds which they seem to do for most of the year if conditions stay mild. You may even be able to spot flower buds and the odd fully open flower on the bush in the photo above which was taken today. Like those of many herbs, rosemary flowers attract beneficial insects. 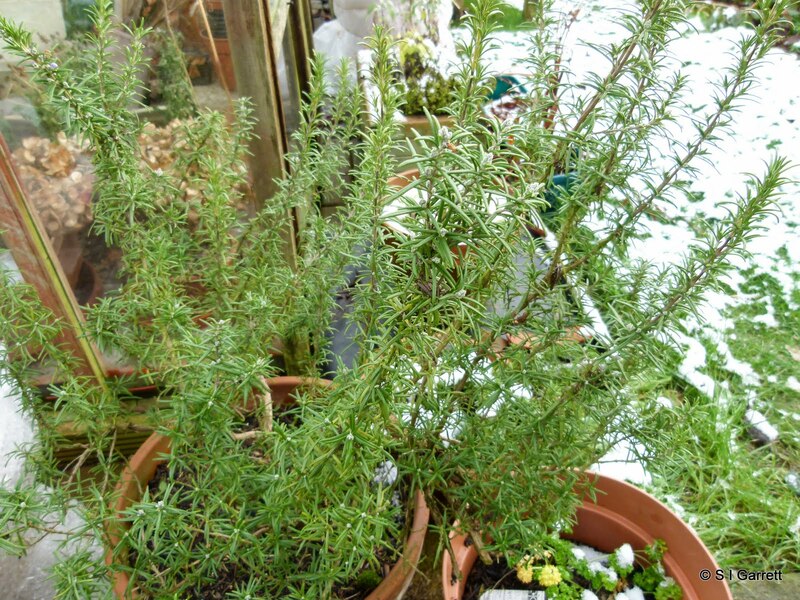 Rosemary is a long lived, evergreen shrub which likes a sunny, sheltered position and grows well in poor soil. Despite this it seems to grow well on our windy allotment site. Rosemary is a native of the Mediterranean area and, although ideally it should be planted in well drained soil, it grows well in our heavy soggy clay. Rosemary will stand very dry conditions and it doesn't need feeding. Our rosemary success just goes to show that it is worth trying to grow a plant even if you can't provide it with ideal conditions. As an insurance policy and to provide some fresh cooking material we also have a couple of rosemary plants in pots by the garden greenhouse. To prevent the bush from becoming woody I give it a trim each year. Cue explanation of the title of the post. Most herbs have a mass of folklore and tradition attached to them and rosemary is no exception. In Ancient Greece, students regularly wore garlands of rosemary braided into their hair or around their necks in order to improve their memory when taking exams. Scientific research seems to conclude that the Greeks were correct in this belief and that rosemary indeed stimulates memory. It is also believed it to be sacred to remembrance, love, loyalty and friendship. Anne of Cleves was supposed to have had sprigs of rosemary in her wedding posy but a fat lot of good it did her! In the 16 and 17 centuries many believed that the aroma of rosemary would offer protection against the plague when it was worn around the neck, burned in sick rooms or used as an ingredient in a cordial. Even today rosemary is said to have all manner of healing properties as described on this website. Leading by a short head. If you are a visitor to Martyn's blog you will already have seen a photo of the first bulbs to open their flowers in our garden. 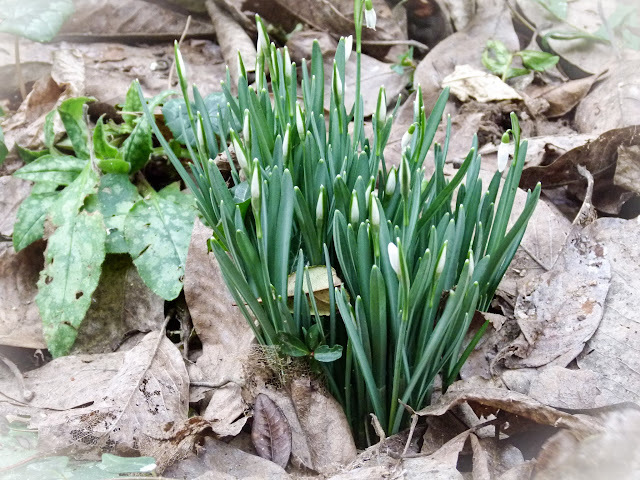 My previous post showed that our snowdrops are poised to burst into flower but haven't yet quite made it. 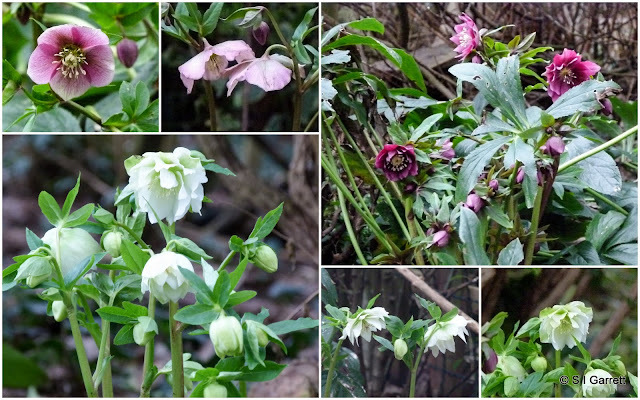 The snowdrops are at the side of our house amongst the hellebores in what we think of as our spring garden. It also the area that houses many of our bird feeders and is therefore a popular bird diner. But the snowdrops have been beaten in the bulb flowering race by the Katherine Hodgkins irises. Katherine produces short almost stemless flowers (hence the short head) which appear before the leaves. In fact these plants don't really have flower stalks at all. The flower is supported on something called a pedicel. The upright petals - the standards - are pale blue. The lower stripy parts of the flower are not petals at all but really sepals and referred to as falls. I'm hoping that the bulbs will eventually bulk up and create drifts of early interest. As you can see some of our crocuses are not too far behind. Spring creeps ever closer. Great excitement for a few minutes yesterday - we had a couple of visitors to the bird diner that we were keeping a watch for. Unfortunately I couldn't get the camera near enough to the window for a decent shot but Martyn managed a short piece of video which he has posted on his blog here. The goldfinches were not impressed meaning our visitors were quickly sent on their way. I hope they risk coming back soon! When does Lent come before Christmas? 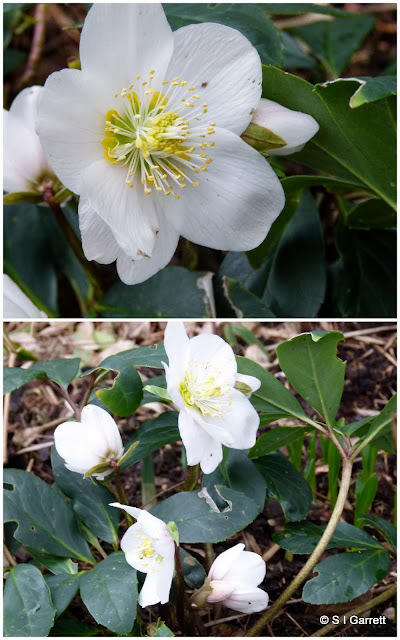 When you grow hellebores. Although both our Christmas and Lenten roses are flowering at the moment, the Lenten roses (hellebore orientalis) started to produce flowers at the beginning of January. Christmas was well over a month ago and this year Lent begins on 13 February and what is more neither plant is remotely related to a rose. Who names these plants? The weather may prevent us from making a start to the new gardening season and we may have lots of preparation still to do on the plot. The greenhouse may still need sorting out but at least we now have all our seeds ready and waiting for sowing. First to arrive were the Kings seeds. These arrived in a very large box but as I order for other people on our site the contents were not all for us. Above is what was left when we took out the items that we hadn't ordered. We are sharing with a friend so they are not all ours but I know that there seems rather a lot. 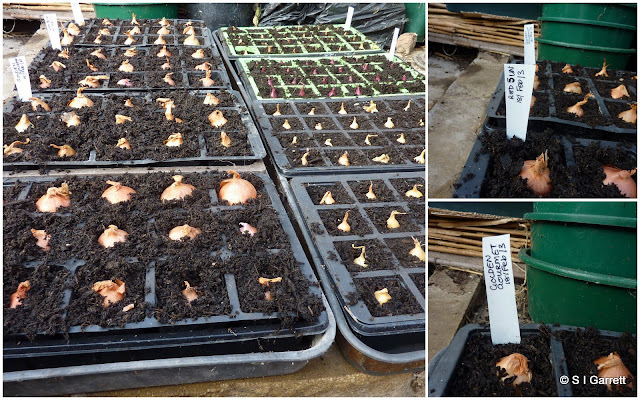 Included in the box are some onions and shallot sets which we will start off in pots in the greenhouse. This seems to work for us. The next parcels to arrive were our seed potatoes from JBA. Here are just some of the contents. In total we received four large boxes but again these are to be shared with a friend. For now these will be stored in the garage until we feel that they will be happy chitting in the greenhouse. Next a smaller package arrived from Plants of Distinction. This package contained the more unusual seeds that we fancied trying along with a free packet of radish seeds - Cherry Belle. Then finally a package arrived from Thompson and Morgan. These are mainly annual flower seeds with the odd packet of herbs. So is it a case of our eyes over-ruling our brains. Will we manage to plant everything? - You'll just have to wait and see. 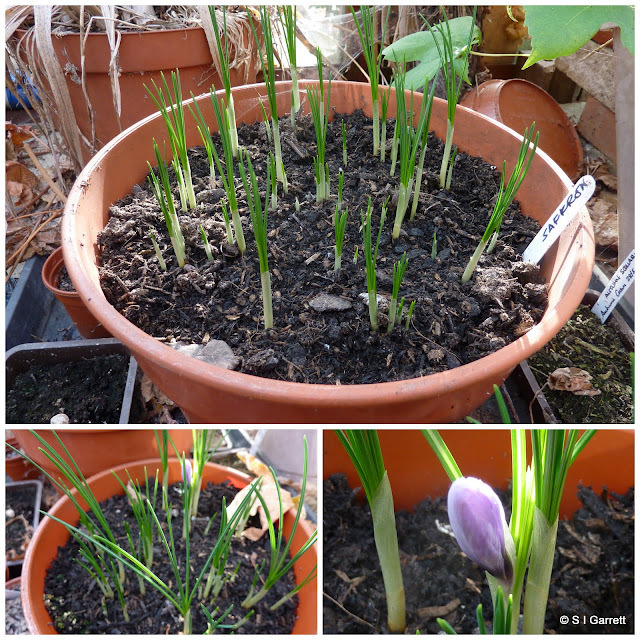 Back in November I posted about the saffron crocuses that I had planted in pots in our cold greenhouse. They had just produced their first flower and I asked for tips on how to harvest the stigma ribbons. 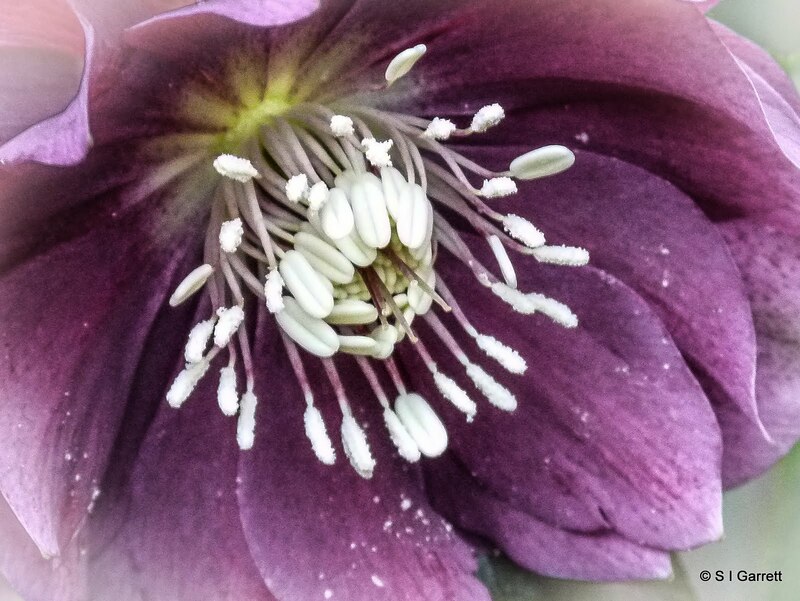 Well I needn't have bothered - that flower was the only one that the bulbs managed to produce. Leaves - yes, flowers - no! I wondered whether I had planted them too late or maybe they should have been planted outside but the friend who gave them to me has had the same problem. She planted hers earlier and planted some in tubs in her greenhouse and others outside in the garden and she too has only had one flower! What's even worse I didn't even manage to pick the stigma from my one flower!